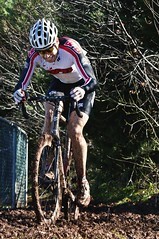 Blair Saunders fights the mud at the 2009 MABRAcross championship. The final race in the BikeReg.com MABRAcross series takes place this Sunday in Taneytown, Md. The MABRAcross Championship race, also know as The Turkey Chase, is historically a sloppy affair with muddy conditions being the rule rather than the exception. The course is fairly straightforward with some tricky off-camber sections and one short run-up. Thanks for all of the positive feedback on the course previews. It was a fun project. Many thanks to Chris Mayhew, Dan Tille, Ken Woodrow, Matt Donahue, and Marc Gwadz for helping make these possible. We will be back next season with all new previews that will include updated course designs and new races. The MABRA series needs to double in size and go through February. I’m nto ready to be done yet!